The following scenario occurred while I was uploading (via DIXF) the standard financial dimensions for a client in Microsoft Dynamics AX 2012 R3. To review, the standard financial dimensions in Microsoft Dynamics AX 2012 are Cost Center, Department and Business Unit. I ran into a bit of a roadblock while I was using the DIEF (Data Import Export Framework) to import financial dimension values for Departments. I was confused because the PartyNumber field (aka Party ID in the global address book) is a mandatory field. I had to have a value for this field. I tried leaving the values empty and got a null error. Now I wasn’t sure which values I should enter and I was nervous about making changes to a key field in the global address book. When creating my Processing group and Generating a source file: I found the right Entity (Main account) and identified that there were 3 Mandatory fields. I also included a couple of additional fields (see screen shot below). So, here’s what you need to do. Create your processing group (I called mine DIM_VAL) and attach it to the Entity = Operating unit. Select your Source data format (your choice, I set up Tab Delimited). Run Generate source file and run Generate source mapping procedures. Now here’s the solution to the global address book, mandatory field (Party ID) requirement: Select “Modify source mapping” from the menu bar under the select entities for processing group form (see screen shot above). On the Action pane, under the View section, select “Mapping details” (screen shot below).Next, find the Source field for PartyNumber and check the Auto-generated box. You don’t need to enter any values in the fields of your source data for PartyNumber. 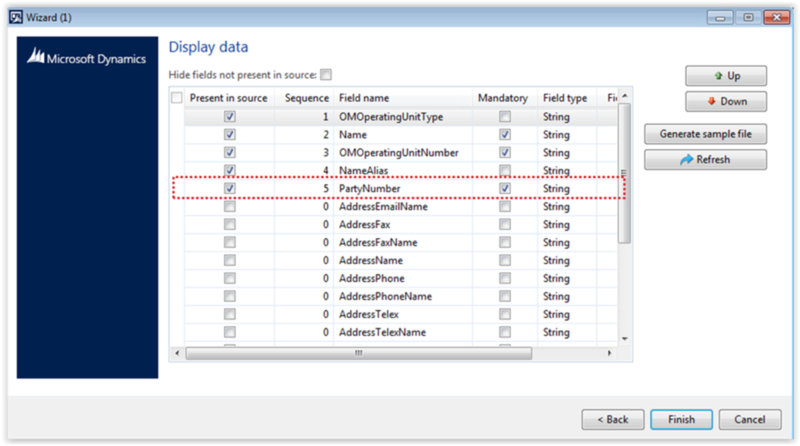 When you Stage your data, AX 2012 will assign the next available Party ID(s) to your imported operating units. NOTE: Another point of caution when using DIEF/DIXF for operating units (Business unit, Department, Cost center) that have existing numeric references. E.g. Advertising is department 152 and Finance is department 226. These Operating units are also considered Organizations in the global address book and Number sequences. Make sure that the Number sequence for Orga_1 is set to Manual before importing your own numeric values. Otherwise, it will not import correctly and the records in the global address book will not appear in the General Ledger module. Microsoft Dynamics AX 2012 offers rich features when it comes to Buyer Push functionality. One scenario, with setup on using this functionality, is illustrated below. Buyer push can be through a replenishment rule linked to the retail (merchandise) hierarchy; via a replenishment hierarchy using the warehouse location weights assigned or with a fixed quantity to all stores selected. The second method would be a common retail scenario if regional distribution centers (DC) are being used to push inventory out to specific stores served by that DC. This is the method in bold above and also illustrated below. A replenishment hierarchy has been set up in Organization Administration> Setup> Organization> Organization hierarchies. The stores shown are for illustrative purposes only. The summary unit (in green) should be the DC and the stores that DC serves (in blue) would be beneath. Each store is a warehouse with a default weight set on it. 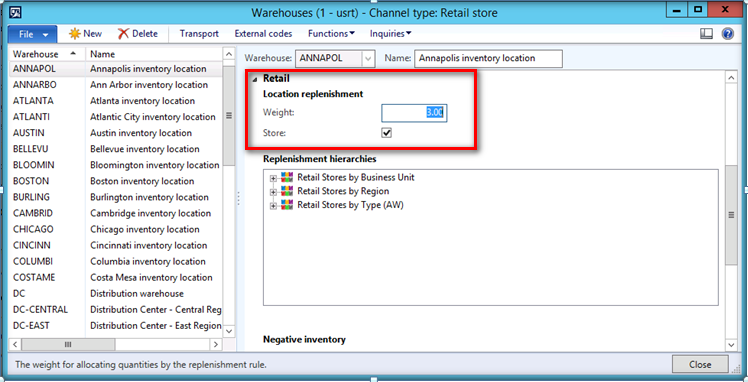 Default weights for stores come from the store warehouse setup (Inventory management> Setup> Inventory breakdown> Warehouses. A store with a weight of ‘3’ will receive three times more of a product than a store with a weight of ‘1’. If using store weight to spread the buyer push, all stores are added up and each store receives a pro rata share. With the setup completed above, the buyer push functionality is ready to use. Navigate to Retail> Common> Replenishment> Buyer’s push. Add a new record, with the from site/warehouse (which will be the DC for NTE). Add a line(s) with the items to distribute and how many to distribute. 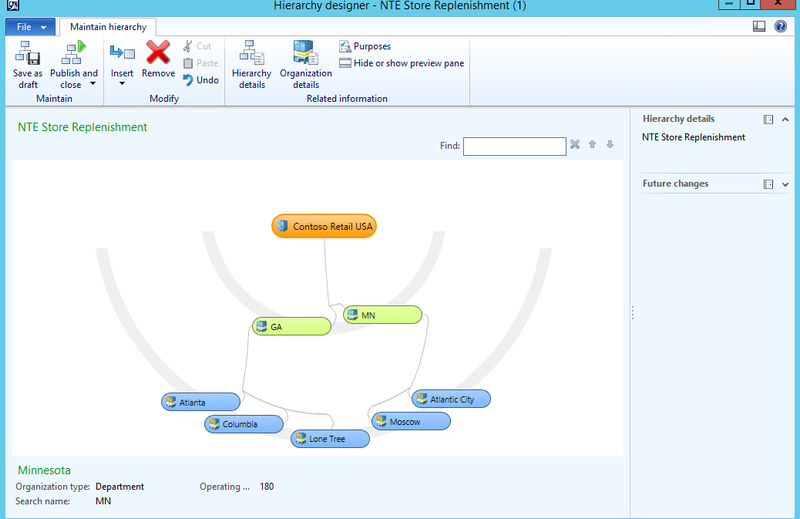 Select ‘Location weight’ and the replenishment hierarchy to use. Stores calculated to receive quantity display in the ‘Warehouse’ area of the form (see below). Review and, if desired, adjust the ‘Pushed quantity’ manually on the lines below. 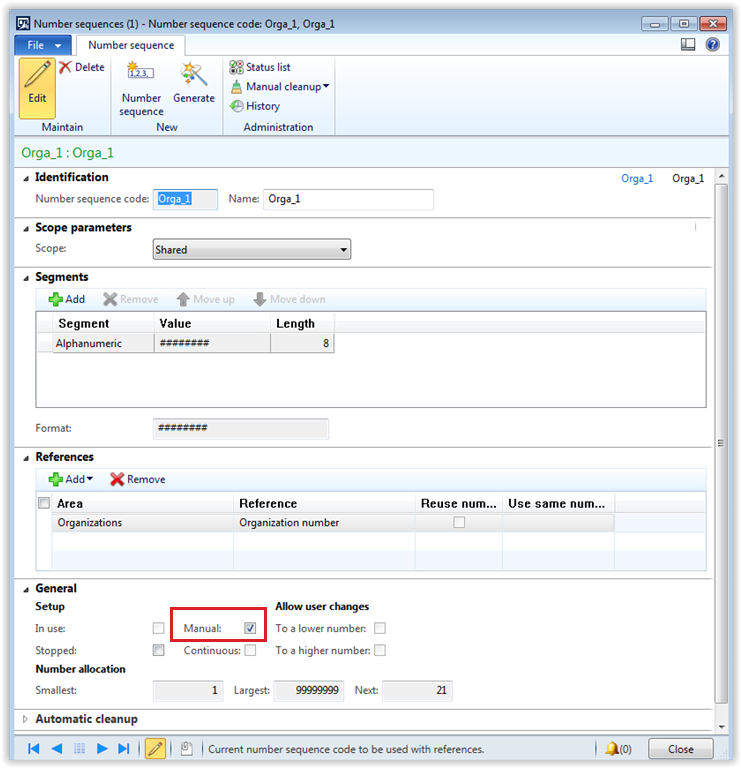 ‘Clear quantities’ allows the form to be reset for adjustment and recalculation. Once the user is satisfied with the quantities displayed, the ‘Create order’ button creates AX transfer orders, which are then processed as any other transfer order. To stay In The Know, follow us on Twitter, like our Facebook page, or follow us on LinkedIn. Welcome to the ITK Spotlight. Where a senior ITK Solutions Group team member will introduce a topic that Retail professionals are interested in to help them with their future or ongoing Retail ERP / CRM project(s). For those of you who are not familiar with ITK Solutions Group, we are retail experts who just happen to be systems integrators. The way we look at it, software is just a tool to solve retail business problems. Our approach is process first, technology second. Susan, can you tell us your experiences as a retailer and as a consultant for retail software in Microsoft Dynamics AX? Sure, I started on the client side of the table as a controller for a public company for 5 years, a CFO for 7 years, consulting for 10 years, 5+ years in the AX space and I worked for one of our esteemed competitors for 5 years. So I had some background before coming to AX 5 years ago. I think I get a little bit of both the client side and the consulting side as far as what the issues are. To be more specific, what retailers need, and what consultants need to offer so that we can find a happy medium. Generally speaking, retail consumers that purchase products / services, across multiple sales channels, tend to be more profitable for retailers than consumers that purchase products /services from a single sales channel. And a large majority of these retailers can’t, or don’t know how to capture this information to better serve their most profitable customers. So what’s the best way to identify who these customers are? And more importantly, how they can turn this data into actionable information? That’s a really good question, and it definitely relates strongly to the concept of Retail Amnesia™. I think sometimes there’s a problem with identifying specific customers. Especially customers that come from brick & mortar stores, because they typically don’t tell you who they are, and you can’t really determine who they are through their credit card information (for legality purposes). However, if there’s a loyalty program in place, then that can help retailers to better identify these customers and also their personal buying habits. E-commerce customers on the other hand, make this process a little bit easier because they are providing retailers with contact and shipping information. So, to answer your question, for retailers that want to find out who their most profitable customers are, what they’re buying, and how they can better serve these customer segments, they should have some sort of loyalty program in place to capture brick and mortar sales data, and have that data aggregated with the rest of their sales data (from all sales channels). This allows retailers to gain a single view of their customers, which will not only help them identify who these customers actually are, but it also gives them the insight they need to create a more personalized shopping experience for each customer segment. To get a bit more granular, how does what you just talked about help to better serve these types of customers and the retailers, as well? Well, if retailers know what their customers buying habits are (which products they typically buy and how often they buy) it can give them the opportunity to more effectively market complimentary products, or even upsell / cross-sell products that might be beneficial for the consumer. For example, if you’re a retailer that sells skin care products and you notice that a particular consumer buys a specific body lotion, then maybe you can point that consumer to a sun screen product or daily face wash that compliments the body lotion that the consumer purchases from you on a regular basis. Or, if you notice that this particular customer is purchasing a body lotion on a weekly basis, you could upsell them to another body lotion that they won’t have to use as often or as much of, which will increase the amount they spend each time, but also decrease how often they need to purchase the product (which would increase their satisfaction and relationship with your company). All of which segues into what the customer gets out this: they get a more personalized shopping experience because the retailer understands what they buy and how often they buy it, which allows them to see offers that are relevant to their personal tastes and preferences. But, keep in mind, this can only be achieved if you know who your customers are, what their buying habits are, and which sales channels they prefer to use. The point is, to better understand your customer so that you can better serve them. Speaking of sales channels, I’d like to circle back to the topic of brick & mortar sales, and how retailers can more effectively capture customer purchase data on this particular channel. What would you suggest as the most effective strategy for finding out who these customers are and what their purchase habits look like? Well, that goes back to having an effective loyalty program in place. Something that will incentivize the customer(s) to give you more information about themselves, so that you can effectively track each purchase and start to better understand their buying habits / patterns. Obviously, not every customer is going to be willing to do this, so there needs to be more of a multi-pronged approach. Another option could be to incentivize consumers to “check-in” at your store via social media in exchange for discounts or other promotional offers for doing so. Finally, with beacon technology becoming more and more feasible, it can provide another option to better enhance the customer’s in-store experience, and also gives retailers another opportunity to capture in-store consumer data. The reality is this: it’s completely dependent on what the retailers are willing to give up, in terms of promotional offers to their customers, in return for the consumer’s brick & mortar sales data. And more importantly, if these promotional offers align with the desired customer’s wants and needs, which may require the retailer to conduct some sort of primary research to figure out, in general, what those wants and needs are. As a caveat to that, retailers have to understand that there is particular demographic of consumers that just don’t want to give out their personal information, regardless of what you offer them. Do you have any suggestions as far as how retailers can more effectively measure how much money they’re making from each channel, so they can better identify which channels are the most profitable? Well the obvious place to start (for me) would be product profitability. GMROI or Gross Margin Return on Investment. How much do you pay for your products? And what’s the gross margin on those products? But it’s not always that simple. You’ll need to dig a bit deeper and understand what the true cost of those products are and if it costs you more to sell them through specific channels. A lot of retailers don’t have the proper data to take into consideration their distribution center and transportation costs (freight and customs) down to the item level and to properly understand channel profitability. Consider the following discussion points. If you’re not having items directly shipped to your stores, but instead, shipped to your distribution center, that will have one cost for distribution. If you have to then ship items to the store, that adds another layer of cost. Also, how much time / money is your distribution center spending to ship these items to your stores vs internally servicing E-commerce? This gets at labor and occupancy costs, which are hard to quantify down to the item level and will be different per channel. Can you actually have a smaller distribution center if you didn’t have Ecommerce at all (can you really cut costs associated with that)? Would you lose store sales as a result? How many store sales are influenced by Ecommerce? Do you know? The point of these questions is that retailers really need to understand specifically what the true cost(s) are, in terms of individual products, and what the true cost(s) are, in terms of selling them in different channels. It can be difficult to quantify everything, but the more granular you can get with your analysis of Cost of Goods Sold (by product and by channel), the more effective (and, I would argue, profitable) you’ll be as an Omni-channel retailer. What are the key questions / suggestions that you ask / give your clients to help them identify the true cost(s) of individual products and also which sales channels make the most sense for them to use for those products? Well, as I mentioned earlier, I like to start with item profitability (How much you spent on the product vs. how much you sell it for). And then move onto the add-ons that are directly attributable to the purchase. What did you pay the vendor or an outside carrier for freight and customs? How much is the labor? What are the fixed expenses? What’s the cost of packaging orders from Ecommerce sales? This will typically help them start thinking through all the costs associated with their products from beginning to end, and should help them make better choices about which products should be sold through which channels, and which products they should consider bundling together. It’s important to look at each product, in terms of its profitability, and also the companion products. To give you an example, let’s say you’re a retailer that sells office products; in this example the product is paper for copy / fax machines. And you realize that you’re not making much money from selling copy paper, via your Ecommerce channel, because the shipping costs are too high due to the weight and gross margin. But, you also realize that the customers that are buying paper from you, via Ecommerce, are also purchasing toner, which is not as expensive for your company to ship, and you get good margin on your toner sales. So maybe that means that you should continue to sell copy paper, via Ecommerce, even though it’s not necessarily profitable to do so, simply because you can recover that cost (and then some) from the combination sales of your toner and paper. Keep in mind that as a retailer, you may not make very much money directly from your Ecommerce channel(s), but your Ecommerce channels could be driving a large portion of sales to your brick & mortar stores (and vice versa). If you’re wondering how ITK can help you do this with Microsoft Dynamics AX + CRM Online – Contact info@itksolutionsgroup.com to set-up an appointment with one of our seasoned retail solutions experts. The cost of accepting credit and debit cards has become unavoidable for retailers as our culture continues to shift from paper to plastic – and I’m not talking about grocery bags. The fees imposed on merchants can be confusing, overwhelming, and sometimes a bit shady. Understanding the breakdown of processing fees and pricing models is essential when shopping for the right Credit Card Merchant Processor or simply trying to understand the fees you’re currently being charged. At a high level, 70-80% of credit card processing costs are considered base costs which are charged by the various credit card issuers (Visa, MasterCard, Discover, etc.). These base costs are NOT negotiable. The credit card processor is the intermediary between the credit card issuing bank and the merchant. The processor’s revenue is a mark-up charged over the base costs. These markups can typically run between 20-30% of the overall processing cost. Mark-up charges ARE negotiable, as these are determined by the processor. ALL credit card processors have one thing in common; they ALL pay the same interchange fees and assessments (base costs). Again, these are not negotiable. Interchange Fees are charges paid directly to the card-issuing bank. Interchange fees are generally comprised of a percentage plus a per-transaction fee such as, 1.92% + $0.12. For each type of transaction, the type of card (over 100+ types) and how it’s processed (such as swiped versus keyed in) can result in a varying combination of percentage + transaction fee. The detailed list can be found in the latest Interchange Matrix (ask your processor for a copy). Assessment fees are imposed by the differing card brands (Visa, MasterCard, Discover). The assessment fees are a set list of fees per transaction (such as NABU, Account Status Inquiry Fee and Processing integrity Fee) and percentage fees (such as Assessment, Acquirer Brand Volume Fee and Cross Border Assessment Fee). You should be clear when reviewing a proposal or a statement, charges labeled “Interchange Fees and Assessments” are purely that! Some less reputable processors will label lines as “Interchange, Assessments, and Fees” – which may actually represent additional non-mandatory fees (and mislead the merchant). Comparing your fees and assessments to the Interchange Matrix will clarify that what you are being charged as a mandatory fee is actually mandatory (and not additional profit for the processor). • The Interchange Plus or Pass Through model is a flat percentage charged in addition to the (non-negotiable) Interchange and Assessment Fees. Common language in the industry would be “Interchange + 22 basis points” meaning, you will be charged Interchange and Assessment Fees + 22 basis points (or 0.22%) on the transaction amount. The next logical question would be to ask: ‘What is the effective rate?’. The processor can provide you with an effective rate based upon your transaction history, but understand that your actual rate will fluctuate depending upon the combination of card types used. This pricing method is transparent in the respect that the processor is passing on the interchange and assessment fees directly to you and then clearly charging you 0.22% on the sum of all transactions processed. If refunds are common in your business, this option allows for interchange credits on refunded transactions. • Bucket, Tier or Bundled Pricing is a pricing model where the processor categorizes interchange fees into three or more buckets such as: Non-Qualified, Mid-Qualified, and Qualified. In this model, each interchange transaction type (remember, there are 100+ types) is assigned to each category by the processor. The processor then assigns a flat percentage rate for each bucket. This pricing model is the most complicated to calculate and compare from processor to processor. Each individual processor can assign whatever interchange transaction type to whatever bucket they choose. With less credible processors, explanations of bundled pricing tiers may be clouded in sales lingo and contain less financial analysis. Often with this rate structure, processors will attempt to obfuscate the actual rate with overcomplicated, redundant answers to common, analysis-driven questions. In summary, comparing one processor’s bundled pricing to another is difficult or impossible. Due to the lack of clarity, bundled pricing should often be avoided. • Flat Percentage is a pricing model that is the most straightforward, but not always the most cost-effective. This pricing model is generally more practical for smaller companies with low volume and/or transactions. For example, a rate may be 2.70% for all credit card transactions. No hassle, no frills, no buckets, no variability. For larger processing volume retailers, the flat percentage may also be used, though transaction volume will most likely yield a lower cost with Interchange Plus pricing. Transaction fees may also be assessed as additional fees in any pricing model and should be considered markup (profit for your processor). Understand the fine print here! If a transaction fee is defined as $0.04, clarify if an authorization and a settlement are considered two transactions or one. Do not ignore the significance of transaction fees, or authorization fees, or whatever terminology the processor may use. These fees can contribute significantly to your cost of processing. Multiple additional factors can affect proposed pricing from a merchant: funding lag (how long the merchant may hold your funds), connection methods, leased versus owned processing equipment, volume, contract length, exit clauses, dedicated support, etc. And, keep in mind, pricing is not everything. Learn about a processors business, annual volumes, reputation, and network reliability among numerous other factors. You wouldn’t buy a car because it’s the cheapest, right? 1. First, understand your current credit card processor statement. Identify which charges are interchange and assessment fees and which are processor mark-up charges. Go line by line through the statement understanding EACH line. 2. Then, accept quotes from potential processors and calculate expected rates to understand what you are paying versus what a new contract might provide. Tyler Barron is an Applications Consultant with a retail business background at ITK Solutions Group. ITK Solutions Group is a retail-focused consulting firm specializing in enterprise resource planning (ERP) solutions. Are Visa and MasterCard Overpriced Dinosaurs? The past few years have witnessed a revolution in retail payment processing. New options in payment processing have emerged from a landscape consisting almost entirely of credit cards, debit cards and store branded cards. Also during this time period, amounts charged for merchant processing of charge cards have continued to rise, which has been a hotly debated topic between processors and retailers. The $7.25B proposed settlement in early July between Visa/MasterCard and a class action group of retailers is the latest development in this conflict. To give some background to the controversy, credit card processors claim that the processing fees themselves have not really increased, but because more consumers are paying with plastic, the dollar amount of fees charged have increased as cash sales have fallen. Retailers claim that fees have increased as well. Without argument, dollars paid by retailers for credit/debit card processing have risen, regardless of the reason. Given the thin margins most retailers operate on, 100 extra basis points paid for credit card processing represents a 10% or more profit decline. Overall, US retailers are estimated to pay $40B a year in processing fees, so the numbers at stake are huge. In determining a method of payment to use and accept, perspectives from customers and merchants differ. For the customer, it’s about ease of payment, perception of security and the ability to pay as desired (over time versus as a direct bank debit). For merchants, after accommodating customers as much as possible on how they want to pay (let’s not make it hard to be our customer, please), it’s about cost of processing, security and the ability to control fraud (avoid chargebacks from processors). Unlike American Express, which has historically low complaint ratios for its market share, Visa/MasterCard comes from a splintered network of bank issuers, with varying customer satisfaction scores. That means that fewer customers are as tied to Visa/MasterCard as a preferred method of payment as they might be to American Express (and Discover, which has similarly high satisfaction scores, though with a much lower market share). If you further factor in customers who are using their Visa/MasterCard as a debit card, their real objective is simply to transfer money from a personal bank account to a merchant to complete a purchase. Much press has been given to Google Wallet, ISIS, Square, Inc. and Groupon as new players in the retail payment arena, but these options all represent better, mostly mobile, ways for payments to be processed via existing customer credit cards (such as Visa, MasterCard, American Express and Discover). This may make paying for purchases more convenient and sometimes more economical for merchants due to economies of scale, but the end processor of the charge is still the major credit card companies. Individual bank initiatives already enable person to person payments and may allow direct person to merchant payments in the future. Almost all of the larger players offer a person to person payment option including US Bank, Wells Fargo, Chase and Bank of America. Social networking site Facebook is currently testing person to person payments in Australia in a move that, if successful, is expected to transition to a wider market. Again, this technology could enable person to merchant payments in the future. PayPal is experimenting with acceptance at physical stores with aggressive pricing for merchants. PayPal as a form of payment is currently being accepted at Home Depot and is planned at many other retailers, including Office Depot, Abercrombie & Fitch, Aeropostale, Barnes & Noble and American Eagle Outfitters. Note that about half of the payments processed by PayPal are directly from user bank accounts or PayPal prepaid accounts (with almost -0- cost to PayPal, allowing very aggressive pricing). The remainder of PayPal-processed payments is via a linked credit card, such as a Visa or MasterCard. Note that these options actually represent new ways to pay for purchases, not new ways to funnel purchases through existing payment methods. All the players are in a position to either offer directly or facilitate pay over time (meaning that they could offer customers both debit and credit services). While most of these payment methods are early in the marketing and acceptance phase, the draw is ease and convenience on the part of customers and lower costs on the part of merchants. Though Visa/MasterCard settled in the retailer initiated class-action lawsuit, as noted above, the settlement leaves Visa/MasterCard in the position of determining and passing off costs very similarly to before, after an 8-month 10 basis point hiatus on swipe fees. The settlement further allows merchants to charge a surcharge for accepting credit cards, which was previously prohibited. Do customers like their Visa/MasterCard enough to pay a 2-3% surcharge for the privilege of using it? If being used as a debit card (really just to effect a bank transfer), probably not. If being used as a form of credit (a credit card at a favorable rate), it’s more debatable. Regardless, with Visa/MasterCard currently controlling about 70% of the total charge card market, will we look back in 10 years and note that this was the height of Visa/MasterCard’s market share? Unless something fundamentally changes in the value that Visa/MasterCard brings to both customers and merchants, it seems a credible outcome. Susan Alvarez is the Vice-President of Consulting Services at ITK Solutions Group. ITK Solutions Group is a retail-focused consulting firm specializing in retail enterprise resource planning (ERP) solutions. What’s So Important about Discovery & Requirements Gathering? You’ll want to minimize the risk involved with a project of this nature, and balance the achievements or success with the required timeframe. As importantly, you will want to establish the “win criteria” which will sustain the implementation over the long haul. Internally, you will want to show mini wins to continue to show the value you are adding to the client and its executive sponsorship. The common goal will require agreement and understanding across all of your constituents in order to achieve the desired results within the timeframe and budget that has been established. Governance Model – Who should be involved? The process of discovery and requirements gathering should involve key executives and stakeholders who are capable of identifying and explaining the goals and strategy that have been established for the company. Identifying the goals and strategy are the basis for driving a discovery and requirements process. Within these two elements are a basis for the project without which could lead to an unfocused effort that may yield lackluster results. Communications Plan – What to say, and when? A communication strategy should be developed so that as the project progresses, there are clear milestone announcements that are circulated throughout the company to not only further emphasize the goals and importance of the project but also to help keep people engaged and understanding the short term wins and progress that are being made. A communication strategy is critical to any enterprise project to maintain the end state in the minds of all those being impacted by this project. The teams in the discovery/requirement phase will need to articulate how each department, office, region will be affected, i.e. what’s the purpose of the project, what’s it look like at the end state, what are the perceived benefits, etc. You should be looking to create a common understanding of the process at all levels that will be affected. With a global project, it will be important to have a common design that will accommodate localization….all consistently supporting the overall business model and vision of the company. Collective problem solving – you, along with the consultant, will create the future-state throughout the discovery process. Leverage these conversations to build strong relationships! Collaborative creation of business solutions – you will identify a variety of opportunities that drive value across the business. Use these moments as an opportunity to build on the relationship moving forward! You will be addressing needs before a final budget has been established, which gives you the power to visualize an ideal future state for the business. It will become apparent that gaps will surface between what your current/future processes are compared to what the current product can provide. It’ll also create a gap analysis between your needs/processes and the functionality of the product out of the box, which is a KEY ELEMENT for the consulting partner and client to understand. The benefit in this process is identifying the gaps during the sales cycle which helps determine “must have” vs. “nice to have” functionality and the ability to assess where, how and if you need to adjust your business process to avoid the need for customization. This phase will establish and identify the skill of the consulting team you will be working with during the implementation. You will also begin to identify key resources from your company who will become integral to the implementation. You will want to be sure the consultants understand business process, in general, but in particular your processes and needs. Establishing those relationships early on helps to ensure greater success for an on time/on budget implementation. It should be noted that changes to the project will come up after the implementation begins. Different perspectives will develop as you progress through your project plan, which will create change. A change order process must be established during the project planning phase with approval criteria that must be adhered to in order to prevent scope creep. The goal is to have a process stable for and to minimize that concern for change orders and drive to an identified target that has been established early. Structure like this will also foster a stronger working relationship with your consulting partner who then becomes part of the entire project team. Chemistry and trust are key success elements between partner consultants. That’s a goal that should not be understated. So we can now assume that the discovery and requirements gathering have taken place. The goal is that the demonstration should offer proof points validating the assumptions we have developed at a high level. The product demonstration is not a training session; it is used to see your processes integrated within the product and to identify those areas that don’t fit, also known as the fit-gap. Once those key elements have been accomplished, the data and information that has been collected thus far should be the basis for a meaningful implementation strategy. Again, as above, a communication strategy must be established and executed before and during the implementation. Key stakeholders should be able to articulate where the project stands compared to the budget and timeline with the support of the partner consultant. Typically, an executive steering committee has been identified with key stakeholders as regular participants in meetings. The committee should include a senior level consultant (Project Manager) from the partner to meet regularly to discuss the project, the budget, its critical path and any obstacles that might have an impact the timeline. These meetings are, and should be, an open dialogue. I have seen this concept of the executive steering committee as being very effective and shows continued executive commitment and involvement in the project. My goal in this article was to take a snapshot of a key phase in the sales cycle for investigating a product. I believe that Discovery and Requirements Gathering are critical elements that will help to ensure the success of your project and significantly help you sleep better at night. This phase is the foundation for driving real value into the project. This phase is an opportunity for the consultants to become experts on your business, build strong relationships with your stakeholders, and become partners moving forward! In summary, if you want to know how successful your next project will be in the end, I suggest taking a good look at how it begins. Sam Coluccio is the co-founder of ITK Solutions Group, a retail-focused consulting firm specializing in retail enterprise resource planning (ERP) solutions. Acronyms are often thrown around the office like softballs. But when you hear the words “PCI Compliance” you probably will want to pay attention – especially if you want to stay in business. What you don’t know can hurt you PCI Compliance or Payment Card Industry Compliance is a set of unified rules and guidelines created by the PCI Security Standards Council (PCI SSI) and enforced by the credit card brands (Visa, MasterCard, American Express, Discover and JCB). These are not “laws” but rather rules enforced by the credit card brands to protect cardholder data. Violations in these PCI rules and guidelines could result in potentially catastrophic fines that could cripple your company and brand. Additionally, you may be suspended from accepting credit cards, which is equally disastrous. The PCI standard has 12 sections and 5 levels that determine the specific steps a business must take to insure protection. There are understandably different requirements for a small business vs. large chain restaurant or an internet retailer vs. a small retail chain. Specific requirements for each card brand may be found below. Are you vulnerable? Depending on your classification level, an on-site assessment and a scan of your network and systems may be necessary. For smaller merchants, just an SAQ (Self-Assessment Questionnaire) is required to be completed that will alert you to potential vulnerabilities and guide you to the steps that must be taken. Often times, this questionnaire is required to be turned in to your credit card processor or bank as validation that you are PCI Compliant. Bottom Line: If your business accepts credit cards, PCI Compliance applies to you and must be taken seriously. If you’re lost, confused, or just don’t understand – your credit card processor can help you with the process. It is in their best interest for you to continue accepting credit cards. Speak to them and ask for guidance, even if you have to politely remind them that YOU pay them. “Plastic” has largely replaced Jacksons, Benjamins and Washingtons. Which is why it’s as important as ever to protect your business and your brand by being PCI Compliant. For more information, go to www.pcisecuritystandards.org. Does Your Retail Implementation Have the ROI it Should? It’s budgeting time and you are evaluating capital expenditures for next year. One project that has been put off for several years is a new, better integrated retail system. This is sometimes a hard sell with the operations and financial segments of the company. Retail systems touch almost every part of the company and can be expensive. After all, you are getting timely sales information, your customers are able to pay out promptly and efficiently, system uptime is reasonable (maybe not great) and loyalty information is being gathered. That’s really all you need, right? Maybe, maybe not. Here are some ideas about what you should expect from a new system and how to evaluate whether such an expenditure would have an appropriate payback for your organization. 1. What is your current inventory out of stock percentage and how can your new implementation improve that? Measuring out of stocks from a web portal is easy; the number of times customers look for products that are not in stock can be electronically captured. In a brick and mortar store situation, the numbers are not so straightforward. You don’t have the dress in the right size or style. Does the customer tell the manager? Usually not. Would it convert to a sale if you did? Often, but not always. A current assessment of your out of stock ratio is important here, if your new system is supposed to integrate more closely to provide better inventory tracking, ordering and replenishment. Let’s consider some numbers at work here. If your out of stocks run 10% of all transactions and you believe that you could convert half of those out of stocks to a sale with better inventory integration and metrics, you should expect to increase your sales by about 5% if the new system fully realizes the potential here. Even a 50% realization of the potential capture would result in a 2.5% increase in sales, which would often fully fund a retail project. 2. 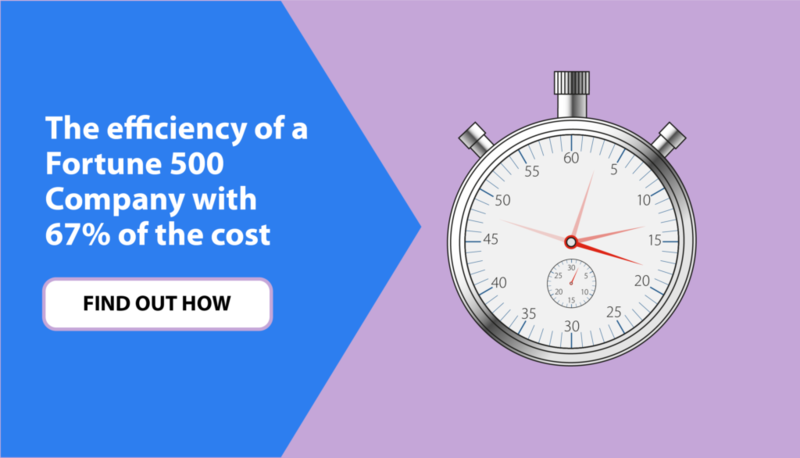 How can your new system reduce the amount of dead inventory and deep discounting that’s required to move slow selling items? The flip side of not having the right items in stock (#1 above) is having the wrong items in stock. What is the cost of your dead inventory disposal? How many items are put on clearance because you had the right items at the wrong time, or in the wrong size? Shelf and rack space is wasted on items that will not sell, with an opportunity cost of displaying items that would sell. How many items are sold at clearance for 50-75% off that should never have been purchased in the first place? Choosing styles involves human judgment, and so it is an art (rather than a science), but a good system can ratchet up the science side and improve the buyer’s chances of nailing down the art side. Again, the numbers in play are large. If your inventory is sold at 70% of suggested price, on average, and your new system could increase that to 75% by better anticipating demand flows and seasonality, a 5% increase in sales could be realized. 3. Can a new system enable new revenue streams? For example, the best new retail systems enable pick, pack and ship functionality at the brick and mortar store level. That is, customers can place an order over the web that your system automatically routes to a store when your fulfillment warehouse is out of stock or low on stock for that item. The store that has the right item in the right color and the right size receives a notification to ship the item directly to the customer. You have not lost a sale, the customer’s needs have been fulfilled and your store manager’s volume goes up, all positive trends. To quantify the possibility, what amount of out of stocks from your web orders could have been filled with store inventory? 1-2 transactions per store per day could increase sales substantially. All the above initiatives increase inventory turnover. In a leveraged situation (where money for inventory is borrowed), the reduction in borrowing costs should be quantified as a project payback (increases your Return on Investment or ROI for the project). The above initiatives should also increase customer satisfaction which, while more difficult to measure, is intrinsic to the success of the company. The above initiatives should be wrapped into project objectives with the before and the expected ‘after’ metrics so that you can measure the project success and tune areas where the project is falling short. Finally, when quantifying project objectives, don’t take all the upside out of the numbers. If you feel the project could get a 10% increase in sales, should get a 7% increase in sales, and a 4% sales increase is a surety, use the surety number. If the ROI justifies from that, the project should be a ‘go’. One of the biggest mistakes that entrepreneurs and business leaders make is failure to track key activities and results. You probably struggle with balancing the reality of running your business day to day while building business value. Setting annual targets once a year and not tracking how your organization is performing on a regular basis is a sure sign of trouble. No tracking = no awareness = no behavior change = NO RESULTS. Prominently displaying these metrics within your organization will motivate your teams. What is the annual revenue target? Divide it by 12 to get your monthly target and then multiply by 4 to get your quarterly target? For example, if you want to gross $1 Million in revenue for 2012 you would set the quarterly target at $250,000 and the monthly target at $83,334. How did you do for Q1? Comparing actual to target is the only way to see how you are doing and course correct if necessary. How are you tracking on expenses? Profitability? Revenue per employee? In sales it is critical to measure consistent activities and behaviors against your sales process. What is the annual quota of your reps? Divide that by 12 to get your monthly target and then multiply by 4 to get your quarterly target? How did your reps track for Q1? + How many meaningful conversations with prospects per day? Per week? Per month? + How many initial meetings are held per week? Per month? + How many second meetings are held per week? Per month? + What is the conversion rate per rep on contracts? How many are won? Lost? Tracking is so simple and it boggles my mind that many business leaders fail to do it. What metrics will you track? Track key metrics and see the difference it makes.